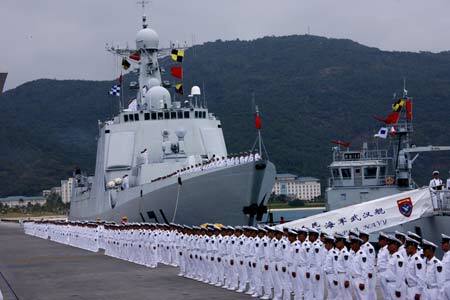 Africa does not much feature in China’s defence annual report China’s National Defence in 2008. Despite much commentary depicting Beijing as engaged in a new resources-based “Scramble for Africa”, the report only mentions the continent in parenthesis when addressing “military operations other than war” (MOOTW) including counter-terrorism training exchanges with South Africa. The document states China currently pursues a national defence policy “which is purely defensive in nature.” But at the same time the People`s Liberation Army`s (PLA) ability to maintain maritime, space and electromagnetic space security and to carry out counter-terrorism, stability, maintenance, emergency rescue and international peacekeeping tasks is taking on an increased importance. In effect, China`s national defence policy takes MOOTW “as an important form of applying national military forces, and scientifically makes and executes plans for the development of MOOTW capabilities”. With China`s first expeditionary naval operation in 600 years now underway off Somalia, the annual report notes the PLA Navy “also attaches importance to MOOTW, training and actively participates in bilateral and multilateral joint training exercises”. China`s prime law enforcement agency, the PLA People`s Armed Police Force has in the period under review sent delegations to over 30 countries for bilateral or multilateral counter-terrorism exchanges, including France, Germany, Spain, Italy, Australia, Israel, Brazil, Cuba, South Africa, Russia and Pakistan. In addition it hosted delegations from 17 countries, notably Russia, Romania, France, Italy, Hungary, South Africa, Egypt, Australia and Belarus. The documented further reported that since 1990 the PLA has sent 11 063 personnel on 18 UN peacekeeping operations. “Eight lost their lives on duty. As of the end of November 2008, China had 1949 military peacekeeping personnel serving in nine UN mission areas and the UN Department of Peacekeeping Operations. “Among them, there were 88 military observers and staff officers; 175 engineering troops and 43 medical personnel for the United Nations Organization Mission in the Democratic Republic of the Congo (MONUC); 275 engineering troops, 240 transportation troops and 43 medical personnel for the United Nations Mission in Liberia (UNMIL); 275 engineering troops, 100 transportation troops and 60 medical personnel for the United Nations Mission in the Sudan (UNMIS); 275 engineering troops and 60 medical personnel for the United Nations Interim Force in Lebanon (UNIFIL); and 315 engineering troops for the African Union/United Nations Hybrid Operation in Darfur (UNAMID). The report says that in terms of “the principles of mutual benefit and common development, China is conducting cooperation with foreign countries in defence-related science, technology and industry. “It emphasizes exchanges and cooperation with developed countries in defence industry technology to draw on their experience in technological development and management. It enhances mutually beneficial cooperation with developing countries, and engages in joint R&D and production in major cooperative projects, in accordance with the national conditions and specific requirements of the partners. “On the export of military items, it adheres to the following principles: It should only serve the purpose of helping the recipient state enhance its capability for legitimate self-defence; it must not impair peace, security and stability of the relevant region or the world as a whole; and it must not be used to interfere in the recipient state’s internal affairs. “China’s defence-related science, technology and industry actively conduct cooperation with other countries in the field of hi-tech industries, combining military and civilian needs, and makes great efforts to develop hi-tech civilian products with high added value,” the report adds. “Major breakthroughs have been made in developing the international market for space products. China has exported its first satellite; and the earth resources satellite project with Brazil has played an important role in both countries’ economic development. China has significantly enhanced its cooperation with other countries in aviation products and technologies, and made new headway in developing the international market for civil aircraft. China’s shipbuilding industry has exported products for civil use in series and batches, further increasing its share in the international market for such products”.